As far as I know, there are 18 ruins of castles in Yorkshire. Two miles to the east of Rievaulx Abbey, there are the ruins of Helmsley Castle. This castle was built from the end of the 12th century to the early 14th century. Once there was the West Tower twined with the keep. They were surrounded by the curtain walls with two gatehouses, one barbican and three towers. Bouble ditches were dug in the outside of the curtain walls. 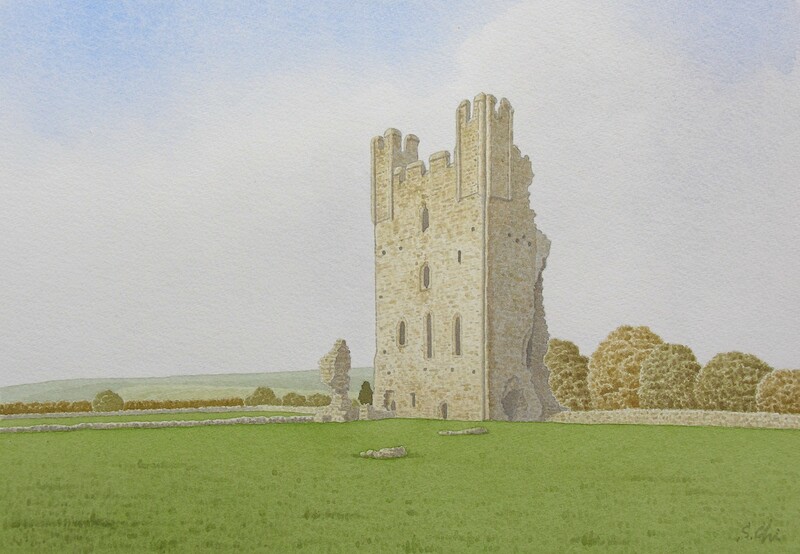 Helmsley Castle was a strong castle, but today the keep, having lost the half of its eastside, stands without curtain walls. Its appearance is very dramatic. This castle was once owned by Richard, Duke of Gloucester. In 17th century, it was owned by George Villiers, 1st Duke of Buckingham and his son, 2nd Duke with the same name. During the Civil War, Helmsley Castle was held by Sir Jordan Crosland, a Royalist for three months after the Royalists were defeated by the Parliamentarians at the Battle of Marston Moor on the 2nd of July in 1644. The Castle was sieged by the Yorkshire Parliamentarians Army commanded by Sir Thomas Fairfax, called "Black Tom", and destroyed severely, ruling out any possibility of restoration. After the Civil War, the castle was abandoned to become ruins. It was the 2nd Duke of Buckingham who took Prince Charles, afterwards King Charles II, to France when the Civil War being lost by the Royalists. The Duke came back to England in 1657 and married Mary, a daughter of Sir Thomas Fairfax who had besieged the castle once. I can see here an interesting reconciliation between the Royalist and the Parliamentarian. During the Civil War, many castles held by the Royalists were besieged by the Cromwellians and became ruins. Pontefract Castle, lying 12 miles to the southeast of Leeds, its original castle built by Ilbert de Lacy, was one of the royal castles and also one of the strongest and most beautiful mediaeval castles. It is the place where the deposed Richard II was murdered in 1400. This castle appears in Shakespeare's historical plays as Pomfret Castle. This castle also suffered sieges three times and was almost levelled by decree of Cromwell after the execution of Charles I. Standing at ruined castles, I would often remember a part of poem by Tu Fu, a Chinese poet (712-770). "Countries may fall, but their rivers and mountains remain: when spring comes to the ruined castle, the grass is green again."